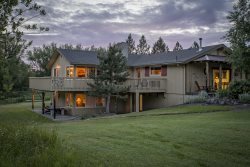 5 acre home perfect for your larger family gathering, wedding, or corporate retreat witihin walking distance to Joseph, Oregon. Homes and cabins that are not pet friendly for our Guests. However, this does not mean that there have not been pets in the house when the Owners of the homes visit. Please ask us if you have questions. Super cute cabin straight out of Pinterest! Sweet knotty pine cabin with large wrap around deck. Downtown Joseph Oregon apartment perfect as a base camp for your Wallowa Lake adventures. Set away from the activities, but close enough to walk to the activities at the resort side of Wallowa Lake! Located in downtown Joseph, it's the perfect place to stay and take in all the downtown activities without having to drive. The perfect place for a couple's retreat! Private outside patio often visited by the deer! Cute and bright a-frame cabin within walking distance to the resort activities of Wallowa Lake.